or go to Account > Scheduled Tasks. Then click Add Scheduled Task. First, type in task name. 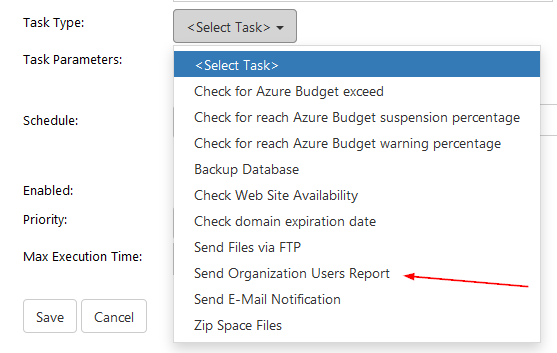 Then select Send Organization Users Report task type from the drop-down menu. You will see extra options for this. Enter email address and select organization for which you want to send users report. You can also check Remove schedule after first execution option. Next, choose how often you want to execute this task: daily, weekly, monthly, only once or in certain interval, and choose starting time for the task. If you select Once, you will need to choose exact date for the task. If you choose Interval, then you will need to specify exact time slots for the task. Check Enabled for a task and select its priority. You can opt for Below Normal or Low. Finally, specify maximum execution time for this task, and click Save. Your new scheduled task has been added.